Doctors will be carrying out a number of further tests. These tests are done to see how LCH affects that part of the body and if any other systems are involved (multi-system disease). This information helps the medical team to decide on the best treatment for your child. • CT Scan – A CT (Computerised Tomography) scan takes a number of x-ray pictures of the body from different angles and uses a computer to convert them into cross-sectional x-ray pictures or ‘slices’ of the body. Depending on how big a part of the body is being scanned this can take between a few seconds and a few minutes. 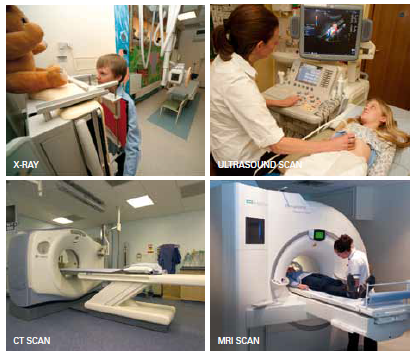 CT scans are painless, but small children may need to be sedated or anaesthetised (‘put to sleep as for an operation’) to ensure they remain still while the scan takes place. • MRI Scan – Magnetic Resonance Imaging (MRI) Scan uses magnetic and radio waves to take pictures of the body. It is painless, but usually takes longer than a CT scan and is quite noisy. As it is important to keep very still, small children are normally sedated or given an anaesthetic. • Water Deprivation Test – if doctors suspect there is a hormone problem known as diabetes insipidus, your child may need to undergo a water deprivation test. This is a test to measure how much urine is made and how concentrated it becomes when no water is given to a patient for a certain amount of time (also called fluid privation test) to complete all of these tests can take between a few days and a couple of weeks and may involve a stay in hospital. When LCH is described as a ‘single system’ disease, it means that it is only affecting one system in the body – for example, skin, bone or an organ. The majority (>70%) of patients have single system disease. If the LCH is only present in one place in that particular system, it is called single site and if in more than one place, it is called multi-site or multi-focal disease. Therefore a child with several affected bones, but no disease elsewhere, is considered to have ‘single system, multi-focal’ disease. When LCH is found in more than one ‘system’, for example, in both the skin and bone, it is described as ‘multi-system’ disease. Children with ‘multisystem’ disease affecting the liver, spleen or bone marrow, are considered to have a more serious form of LCH. This is then described as multi-system disease with ‘risk organ’ involvement and may require more intensive treatment.